Have you ever wondered what it would be like to swim alongside dolphins, one of the smartest mammals on the planet? 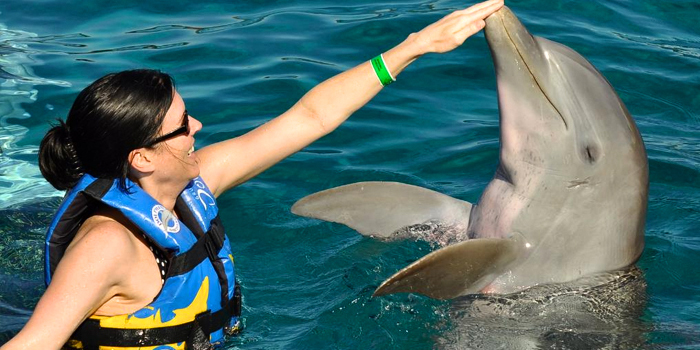 At Dolphin Discovery, on the picturesque island of Cozumel, you can make that dream a reality. Our friendly dolphins are highly trained and guests on the Royal Swim Tour get the unforgettable experience of getting to swim, kiss, hug, and shake hands with an Atlantic Bottlenose dolphin. Welcome to Dolphin Discovery! One of the best ways to enjoy our park is by getting to know our most valuable team members – our Atlantic Bottlenose dolphins. The Royal Swim Tour is a once in a lifetime experience available at Chankanaab National park in Cozumel. When you finish with the dolphins, enjoy a buffet lunch in paradise and 2 non-alcoholic beverages as you take in the beautiful landscape and warm breezes. After your Royal Swim Tour, you can enjoy the other facilities of the Chankanaab National Reef Park and the island of Cozumel, including sunbathing at our world-renowned beaches, shopping, or the national park’s garden. Snorkeling in the crystal-clear blue water of the Caribbean is also included in this unique and unforgettable experience. Equipment is not included, so don’t forget to bring your own gear. 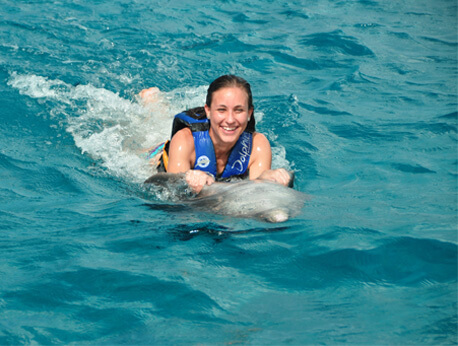 Guests should also plan to bring towels and cash (in Mexican pesos) for any additional activities they’d like to partake in outside of the dolphin experience. Don’t forget to wear biodegradable sunscreen to protect yourself, the reefs, and our marine mammals!